This is the site supporting the book Grammatical inference: learning automata and grammars . Here you may download the table of contents and a couple of chapters. Discussion about the material in the book is also encouraged! I will try to mantain some useful material linked with grammatical inference, and specially so software. I always welcome comments, suggestions, questions, new elements! 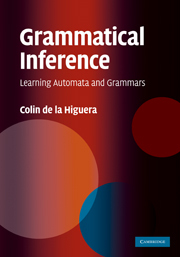 Book: Grammatical inference: learning automata and grammars. Part II. What Does Learning a Language Mean? All material in these pages is Copyright 2010 by Colin de la Higuera.